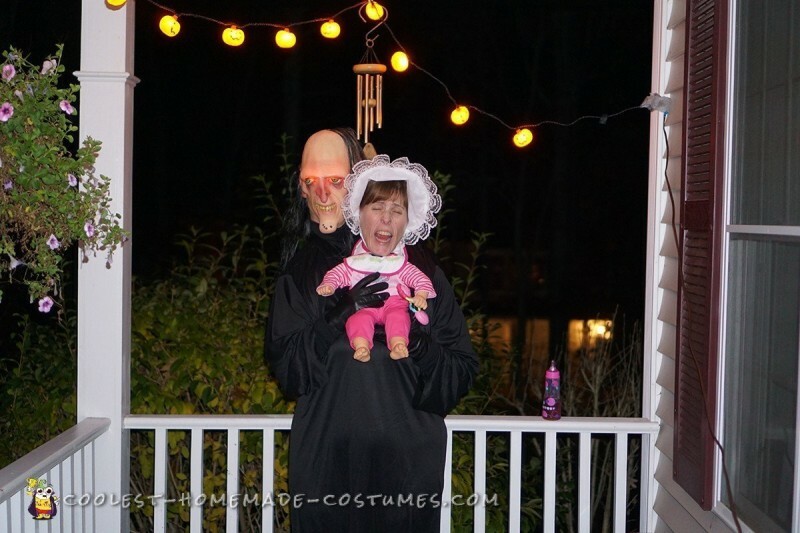 Realistic Baby Abduction that Freaked Out Every Adult at the Party! 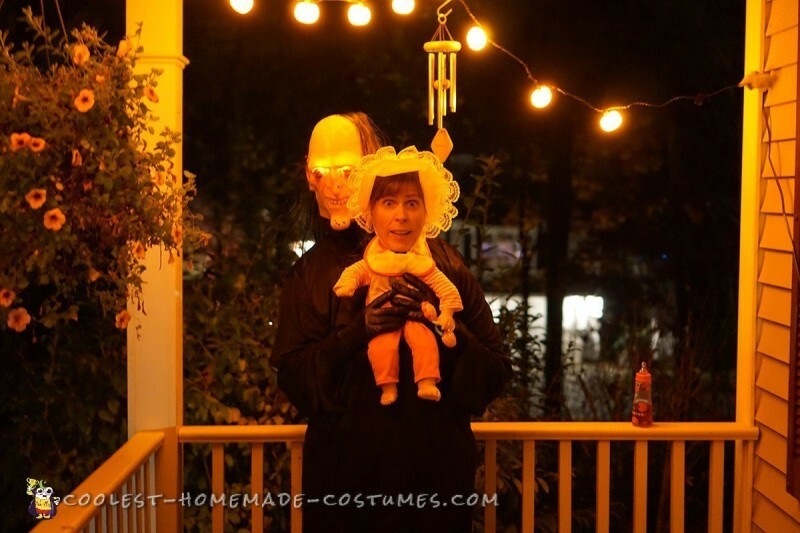 I’ve seen quite a few alien baby abduction costumes and they looked great, but I wanted to make one that seemed more realistic and disconcerting to adults. And I succeeded! First, I had to find the perfect mask. I wanted it to seem as realistic as possible – not a monster or alien, but a man. I found that mask in “Uncle Creepy.” A nasty looking, balding man with warts, thin hair, and a big nose. Very creepy! Next, I got out an old backpack and put in some florist foam – the kind that when you insert something into it, it shapes itself to what you inserted. I bought a dowel and a Styrofoam head, and put the head onto the dowel. I put Uncle Creepy’s mask onto the Styrofoam head, then duct-taped the dowel onto a plastic clothes hanger. I attached foam onto the shoulders of the hanger to add height and depth to Uncle Creepy’s shoulders, then inserted the dowel into the florist foam in the backpack. This held Uncle Creepy very securely without the need for duct tape. I also put a black turtleneck over the hanger so it would come up under his neck to hide the bottom of the mask. I had some small red battery-operated lights left over from another project, and attached them inside the mask, just under the eyes, so the eyes would light up red at the party. Next, I bought a cheap baby doll at a department store and cut the head off and sewed the neck shut to be able to tuck the doll body under my neck. The doll was somewhat heavy and I knew I would not be able to pin it to whatever I was wearing, so I got a strap, cut it in half, and sewed each half to one side of the doll neck and added Velcro to the ends so I could secure it around the back on my neck. 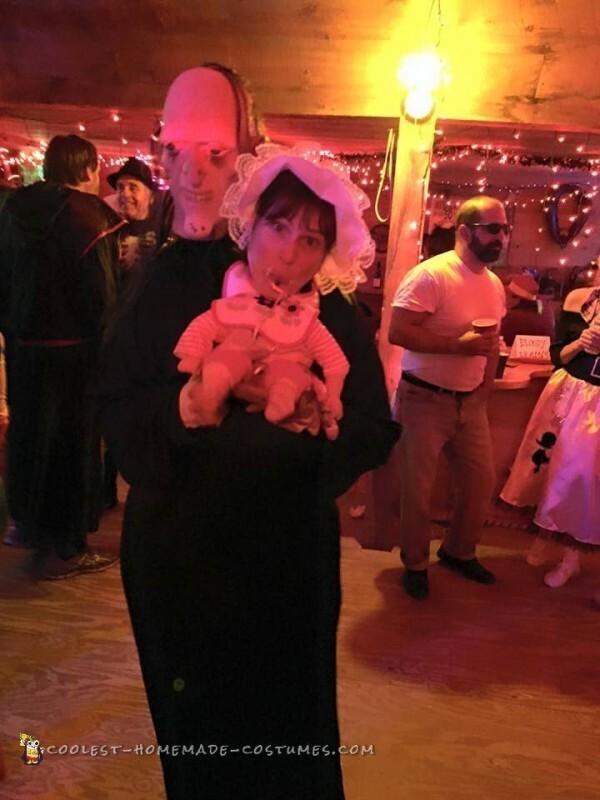 A baby bib then covered the doll neck along with my neck which aided in the realistic look. I put on an adult-sized baby bonnet and got an adult-sized pacifier, tied a string around it, and put it around my neck to leave it hanging or put it in my mouth for effect. I also bought a baby bottle and cut the tip a little so I could actually use it to drink something at the party. I found a size XXL black robe and put it over the mask, hanger, and myself. The neck opening was perfect – large enough around to go over Uncle Creepy and to have my head come through it and complete the illusion. I put on black gloves to make it look like Uncle Creepy was holding the baby. I turned the red lights on under his eyes, and then I went to the party. From the moment I walked in, I was met with huge, wide-eyed stares and people backing away, trying to figure out what they were seeing. Some looked for 2 pairs of feet, thinking that there was another actual person behind me holding me. Most shook their heads and laughed or backed up. It was hilarious! When I would drink from the bottle, this turned out to be the best effect! It looked like Uncle Creepy was feeding me, and people’s mouths gaped open because it looked so real! 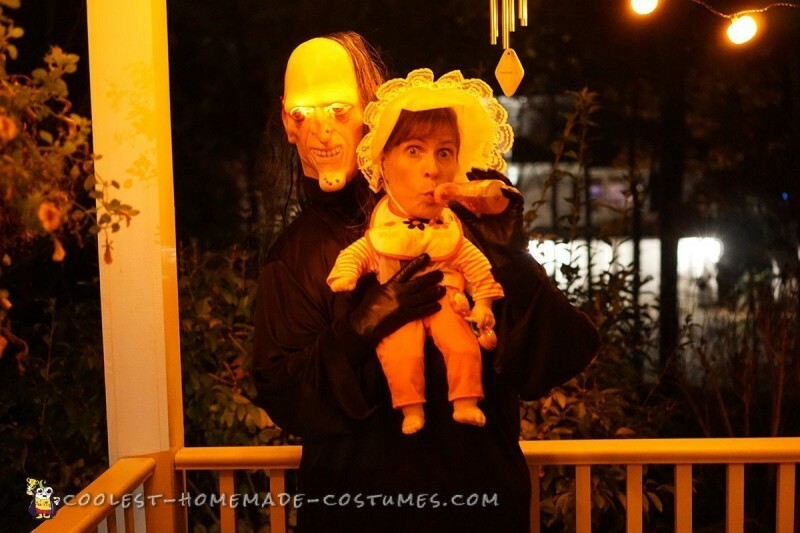 When there was a costume at the party that was inappropriate for a baby’s eyes, I would cover my eyes with my hand and it would look just like Uncle Creepy was protecting my tender eyes from a bad sight. Too funny! The highlight of the evening was when I went onto the dance floor and started swinging the baby’s legs around. The entire dance floor opened up a hole in the middle for me, and I played it up. There were people laughing so hard they had tears flowing down their eyes. Unanimously voted the best costume of the night! At this party, no one wears the same costume twice. But everyone said I must wear it again next year, or put my husband in it and I think we will!